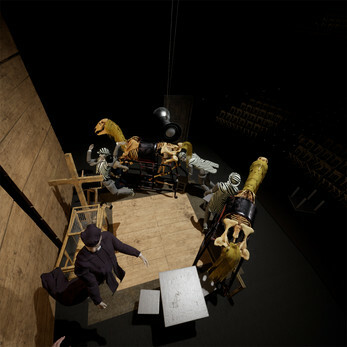 Cricoterie is a Virtual Reality simulation based on the theater of Tadeusz Kantor. In an empty theater you are confronted with a large wardrobe in the middle of the stage. Every time you close its doors, a new object appears: a stage prop or actor inspired by the work of the late Polish visual artist and theater director Tadeusz Kantor. You play the role of the director. You arrange the objects on stage to see what will happen. What will happen inside of you. A soldier, a priest, a crate, a burlap sack, gallows, the skeleton of a horse, a cabaret entertainer, a cleaning woman, a flag, the bride. At the end they all dance in a round and leave the stage. Then you begin again. 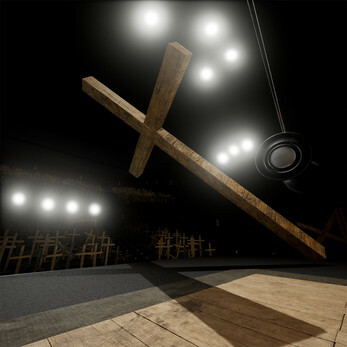 Cricoterie is a software program in development at Tale of Tales. It requires a virtual reality headset and controllers (such as HTC Vive or Oculus Rift) and a suitable PC. The project is designed to be exhibited in the context of a physical installation. But it can be enjoyed at home as well. The archive contains detailed instructions. Cricoterie is a coproduction with the Adam Mickiewicz Institute and the Tadeusz Kantor Foundation. The production is supported by the Flanders Audiovisual Fund.